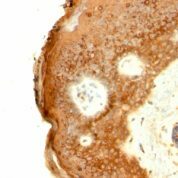 It recognizes a protein of 66kDa-170kDa, identified as involucrin. In Western Blot of cultured human keratinocytes, this MAb reacts with a 120kDa protein. 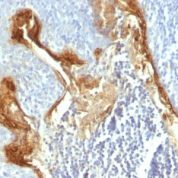 It stains the involucrin in a variety of sizes: 170kDa in MCF-7 cells, a doublet of ~115kDa, 150kDa in gorilla, owl monkey, 66kDa in Canine,, a doublet of 105kDa in pig. 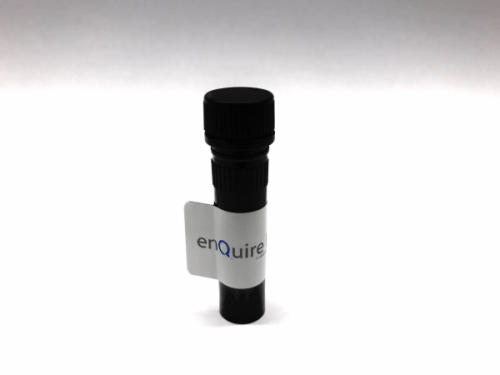 Its epitope maps between codon 421-568 of human involucrin. Involucrin is expressed in a range of stratified squamous epithelia, including the cornea, which lacks a distinct cornified layer. In normal epidermis, it is first expressed in the upper spinous layers,, in keratinocyte cultures, all cells that have left the basal layer express it. 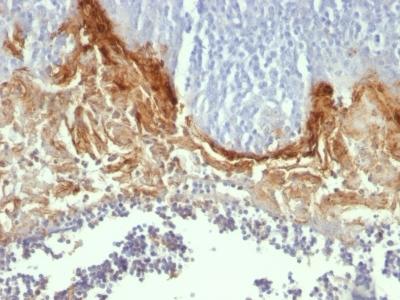 Involucrin expression is altered in pathological conditions: in psoriasis, other benign epidermal hyperplasias, involucrin expression begins closer to the basal layer than normal; expression is abnormal in squamous cell carcinomas, premalignant lesions,, is reduced in severe dysplasias of the larynx, cervix. Anti-Human, Gorilla, Owl monkey, Pig, Canine, and Mouse (-) Involucrin Positive Control Sample: MCF-7 cells. Localized to upper spinous, granular layers in normal skin.